← Oh, what a year it has been! The last inauguration I listened to was a little less than a year ago when the worst President of my lifetime was sworn in. 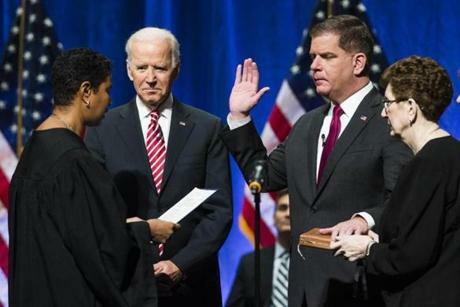 This morning, with former Vice President Joe Biden by his side, Marty Walsh took the oath of office for a second term as mayor of Boston, a stirring reminder of what happens when elected leaders speak to the best of our natures. Both Walsh and Biden spoke to the historical importance of Boston. “Since 1630, Boston has been a refuge: from religious persecution, from hunger and war and discrimination, and now, also, from climate change,” said Walsh. He spoke broadly about his long-term Imagine Boston 2030 plan (developed parallel to the rightly failed Boston 2024 Olympics bid) and in great detail about rebuilding the school system’s infrastructure, linking BPS to local colleges and universities and jobs. Walsh also spoke with passion about housing as the key to opportunity. His already robust housing plans will be amplified by a new regional approach, to be announced this spring. His history of addiction and recovery made all the more authentic his approach to the opioid crisis and homelessness, promising to rebuild the bridge to Long Island and creating long-term recovery programs there. He pledged to become the nation’s first major city to end chronic homelessness. Standard Democratic Party fare? Perhaps, but considering the Trump administration assaults we have witnessed, hearing someone paint an alternative to the politics of divisiveness, the assault on health care, rounding up of immigrants, undercutting of environmental protections, and withdrawal from global leadership, that fare seems pretty sustaining. “We are more than “a city upon a hill, with the eyes of all people upon us.” We are a city built by all the peoples of the world, as they turn hunger into hope, crisis into recovery, and conflict into community. “We are one of the greatest cities of the world, and after nearly four centuries our greatest days are yet to come,” he said. There’s no doubt that Boston faces many challenges, especially in the areas of race relations, housing costs, education and transit. And inaugural addresses tend to be part self-congratulatory and part aspirational. But to do the right thing one must start by saying the right thing. At least Walsh and Biden, while acknowledging Boston’s challenges, today gave voice to the values of character, integrity, community, diversity, the development of individuals’ full potential, collaboration and respect that have seemed far gone from the national scene. This New Year’s Day pocket of resistance was reassuring and inspirational. This entry was posted in Politics, Uncategorized and tagged affordable housing in Boston, Boston history of firsts, differences MA & DC, Imagine Boston 2030, Mayor Walsh inauguration, public schools infrastructure, VP Joe Biden presides at Walsh event, Walsh leads on immigration. Bookmark the permalink.